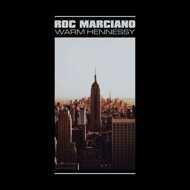 Roc Marciano’s “Warm Hennessy” EP is a compilation of previously released singles produced by Arch Druids featuring Dino Brave (of The UN), Hus Kingpin & Sean Smoov of Tha Connection. This is also the first time the highly sought-after J-Force, Nuance and Bankrupt European remixes are available on vinyl, in both the original and instrumental version. Limited run of 500 copies (200 label exclusive yellow LPs / 300 black LPs).